Well I just managed to get in a last painting for 2011 - testing out some new paints on a copy of a Degas from an old calendar yesterday. Those art calendars are brilliant for reasonable quality prints and I must make sure I get one for 2012. Anyway, this was just a quicky to get the feel of brush and oil again, its been a month since my last painting and that is way too long, must get my priorities right from now on. 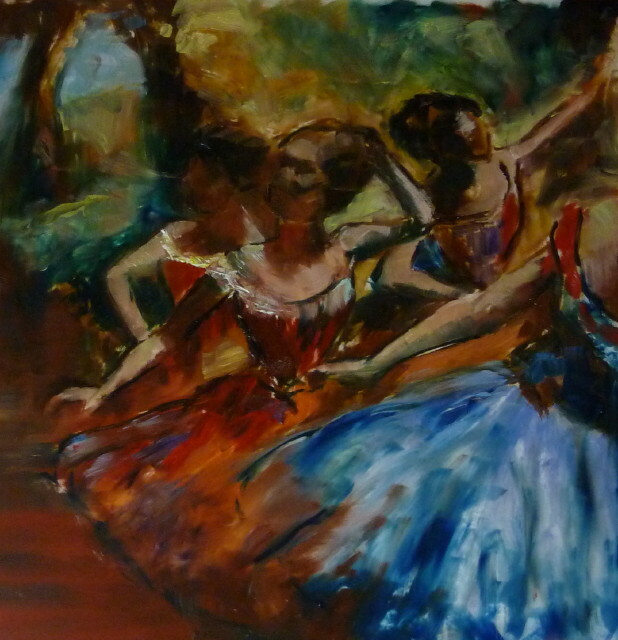 I think this is my first attempt at a Degas, the original is a pastel but although I dont think its 'me' it was very interesting on a number of levels. I already appreciated that he was an amazing draughtsman and his compositions are just so clever but I dont think I could ever 'see' how he did. Blind faith kept me going on this but so much of it felt wrong, the darkness of the shadows, the black outlines, the lack of detail and definition, and a lot of the time it felt more like drawing than painting. What genius he was and I am really kicking myself now that I didnt make it to the exhibition at the RA last year. I havent seen Leonardo at the National gallery yet either.....tsk, tsk.....Master studies are so useful and satisfying - thanks to Richard for opening my eyes to that way back when. Oil on film 12" x 12"